Lock in a great price for Sumberkima Hill Retreat - rated 9.3 by recent guests. Amazing private villas surrounded by nature and ideal for a relaxing holiday. We ended up changing our booking into a larger villa with private pool and it was the best choice. Great view and very quiet. Absolutely incredible location and feel to the Villas; breathtaking views. Villa design is excellent. Customer service was excellent throughout. Great experience using the Suma Restaurant for most of our food. Organised a day trip to menjangan for snorkelling which was an incredible experience (we organised a private trip for the small premium). We loved EVERYTHING about this place. It is so romantic and beautiful. 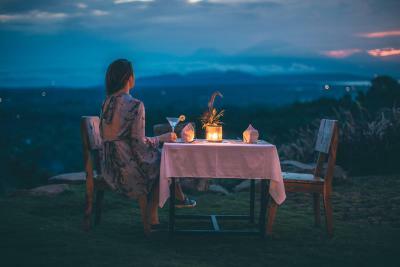 We asked the hotel to arrange a couple’s massage - which was the best massage ever with views over the hillside and ocean. The staff are brilliant. The shared infinity pool is great. Restaurant prices are perfect. We will definitely stay here again - actually we can’t stop talking about it :) we had the traditional wooden house which was much bigger than we had thought and absolutely beautiful. Next time we might try one of the other villas, but we are missing our wooden house each day that passes. Wonderful stay in great and affordable villas. Great view from the hills. Very friendly and supportive staff. All in all very good. We stayed at this extraordinary little villa, very tastefully constructed and furnished with its beautiful private pool and breathtaking view over palm trees all the way down to the ocean. Everything was perfect! The complementary shuttle service was great to get to the beach or the village. The restaurant was delicious and once again, boasted an incredible view. Staff were very friendly and efficient! Although it rained quite a lot while we were there, we never felt cut-off from the outside world due to the view and the pool. Simply paradise! The setting is perfect. The views are brilliant. The design and furnishings of the Villa are state of the art. The infinity pool is amazing. The restaurants on site are great. I love the hospitality, the smile on everybody's faces. The beautiful location with two really good restaurants, the amazing massage therapist, the tours and the peaceful location. I will be back ❤️ also if you are a diver it's a perfect place, only 15 min drive to the National Park. Great view with free shuttle service to the beach. Spa treatment available. Food is good. Room service was a great addition! Staff very friendly and make you feel welcomed! All villas have a well-equipped kitchen while the rooms have a small fridge. Towels and bed linen are featured. Each villa has a private pool while the rooms share a pool. 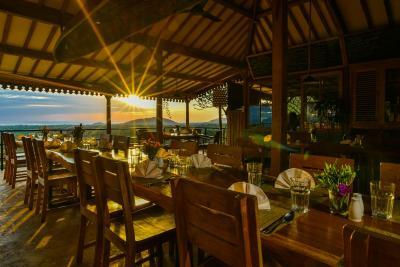 Guests can enjoy the beautiful Sumberkima Bay view while dining at the on-site Suma Restaurant. Senja Restaurant serves Indonesian dishes with park view. The property also offers packed lunches. 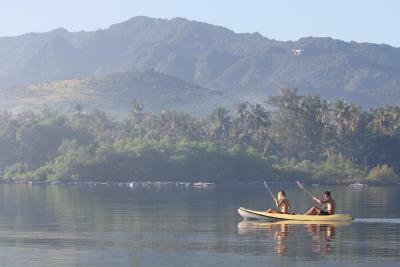 Bike and motorbike hire are available at the property and the area is popular for trekking, diving and snorkeling. A selection of activities are offered in the area, such as diving and cycling. Guests can approach the friendly staff to arrange for relaxing treatments or massage, and also plan day trips to the surrounding areas. Lessons for Yoga, diving and cooking can also be arranged. Sumberkima Hill Retreat has been welcoming Booking.com guests since 14 Aug 2015. 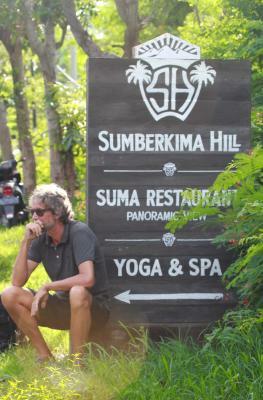 When would you like to stay at Sumberkima Hill Retreat? This villa has a private pool, a lounge room with seating and dining area and a kitchen. It's fitted with air conditioning, a flat-screen TV, a fridge and kitchenware. Each bedroom comes with an en suite bathroom and free toiletries. This villa features a private pool, a lounge room with seating and dining area and a kitchen. It's fitted with air conditioning, a flat-screen TV, a fridge and kitchenware. Each bedroom comes with an en suite bathroom. Fresh towels and free toiletries are provided. This villa has a private pool, a lounge room with seating and dining area and a kitchen. It's fitted with air conditioning, a flat-screen TV, a fridge and kitchenware. Each bedroom comes with an en suite bathroom. Fresh towels and free toiletries are provided. Featuring Javanese-style wooden house, this villa has a small lounge room with seating area, a private patio in the garden and a large outdoor bathroom. It's fitted with air conditioning, a personal safe and a fridge. Guests can enjoy the en suite bathroom. Fresh towels and free toiletries are provided. Please note that this villa can only accommodate one extra bed. Guests have access to the shared infinity pool. This villa features a private pool, a lounge room with seating and dining area and a kitchen. It's fitted with air conditioning, a flat-screen TV, a fridge and kitchenware. Each bedroom has an en suite bathroom with free toiletries. Suitable for up to 11 guests, this villa features a private pool, a large lounge room with seating and dining area, a terrace with sea view and a well-equipped kitchen. Every bedroom has a private bathroom with a shower, towels and free toiletries. This villa features a private pool, a lounge room with seating and dining area, a kitchen and a terrace with sea view. It's fitted with air conditioning, a flat-screen TV, a fridge and kitchenware. Each bedroom has an en suite bathroom with a shower and free toiletries. A three bedroom villa, with one bedroom separated and situated next to the pool. It comes with an extra kitchen with lounge area with seating a terrace with sea view. It's fitted with air conditioning, a flat-screen TV, a fridge and kitchenware. This villa has en suite bathrooms with a shower with towels and free toiletries. Offering views of the sea, this villa has a private entrance, a lounge room with seating and dining area, a terrace and a kitchen. The bedroom has an en suite bathroom with a shower, towels and free toiletries. Guests can relax in the private infinity pool. Featuring a large garden overlooking the sea, this villa has a private pool, a lounge room with seating and dining area, a terrace with a fan, and a kitchen. 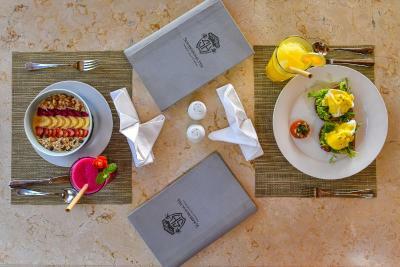 There are 3 air-conditioned bedrooms and 2 bathrooms with a shower, towels and free toiletries. This villa has a private pool, a large fan-cooled lounge room with seating and dining area, as well as a spacious terrace. There are 5 bedrooms and 4 bathrooms with a shower, towels and free toiletries. The studio has a small lounge with a seating area, a kitchen and a terrace with dining area. It's fitted with air conditioning and a personal safe. The private bathroom has a shower, towels and free toiletries. This room is fitted with air conditioning and a personal safe. Furnished with a wardrobe, a desk and mosquito nets, the room comes with a large terrace, a seating area and a private bathroom. Towels and free toiletries are provided. Guests have access to the shared infinity pool. Featuring a private pool, this villa has a lounge room with seating and dining area and a kitchen. It's fitted with air conditioning, a flat-screen TV, a fridge and kitchenware. Each bedroom has an en suite bathroom with free toiletries. The master bedroom is larger and has a bath with a view. Featuring a private pool, this villa has a kitchen and a lounge room with seating and dining area. It's fitted with air conditioning, a flat-screen TV, a fridge and kitchenware. Each bedroom has an en suite bathroom with free toiletries. Featuring views of sunset and sunrise over the sea, this villa has a private pool, a kitchen and a lounge room with seating and dining area. 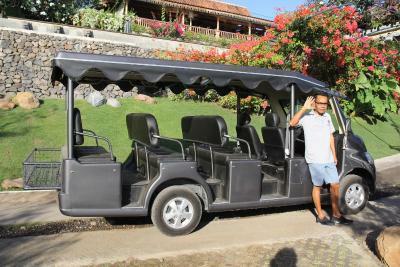 It's fitted with air conditioning, a flat-screen TV, a fridge and kitchenware. The bedroom has an en suite bathroom with free toiletries. This villa features a private pool with a terrace. The unit comes with a flat-screen TV, 2 en suite bathrooms with free toiletries, and a kitchen with a dining area. This villa has a private infinity pool with sea and mountain views. It features a lounge, a kitchen, and bathrooms with free toiletries.